1. Choose a Funeral Home/Director — A funeral home provides burial and funeral services for the deceased and their families.The funeral director can help you select a casket or an urn, and will explain options for managing the decendent’s remains from funeral home to any religious ceremony and then to the cemetery. Click here for assistance with choosing a funeral home in the Pittsburgh, PA area. 2. Make Religious Ceremony Arrangements — The funeral home will contact your family’s Catholic church to make arrangements for a funeral service. Religious service arrangements are made directly with the church administrator. Click here for more information on funeral planning. 3. Select a Cemetery —If your family does not already have a cemetery, talk to Rome Monument 724-770-0100 or funeral director about the cemetery options in your area. 4. Purchase a Burial Plot — Once you’ve selected a cemetery, the cemetery administrator can help you choose a plot that includes gravesites for you and your family. 5. 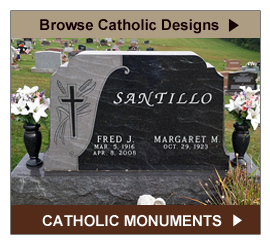 Select a Memorial— A Catholic headstone, marker or monument should be part of your preplanning as well. Read the Frequently Asked Questions (FAQs) about planning a Catholic funeral with answers and information on checklists, templates, worksheets, funeral readings and Catholic memorial services. While most prefer not to think about end-of-life issues, preplanning a Catholic funeral is very common and highly recommended. With a little focus and effort you can make sure your funeral happens in accordance with your expectations while reducing uncertainties, anxiety, and costs for your family. Click here for a Catholic Funeral Planning checklist. While we are the experts in designing and creating every type of traditional and cremation Catholic memorial -- flat markers, upright monuments, family and estate memorials, columbariums and mausoleums -- other Pittsburgh-area resources focus on helping Catholic families plan their funeral arrangements in advance. The Catholic Funeral Plan™, is an insurance policy sold by the salespeople in the Diocese, which some will consider. A more direct option is for families to work directly with their trusted funeral director to make sure their wishes are executed and there is no middleman. The funeral home offers a pre-arranged insurance policy that can be transferred to another funeral home should you decide or can also be transferred if that funeral home goes out of business. Your money is safe with the funeral home. Speaking directly with your trusted funeral home will ensure that your family is fully aware of all the different options and services that the funeral home provides. In addition you will be given exact costs from the funeral home so that you are not setting aside more funds than what is needed to fulfill your wishes. 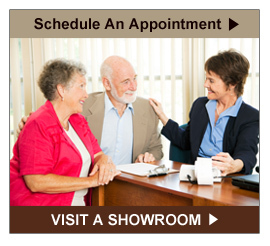 Click here for more information on funeral products and services in Pittsburgh. This step is often skipped over until an individual has passed on. Pre-Arranging Your Cemetery Monument is probably the first thing you should do when preplanning your Catholic funeral. The selection, design, and purchase of your Catholic memorial in advance ensures that it is in accordance with your wishes and not someone else’s. It also ensures that the design and style of your monument is permitted in the cemetery of your choice. Another benefit is that your family will not be pressed to make difficult choices in time of mourning or incur the cost of the monument. When preplanning your funeral, give yourself time to visit with a monument company’s designers to fully understand the complete range of monument designs, materials, and options available to you. To learn why funeral homes in Pittsburgh recommend Rome Monument, click here. Since 1934, Catholic families in Pittsburgh, Western Pennsylvania, and the Tri-State area have chosen Rome Monument to help them preplan their Catholic cemetery headstones, gravestones and monuments. Our Catholic Monument Plan and Pre-Arranged Cemetery Monument Plan both guarantee that you get the Catholic headstone you want at the price you want to pay, while taking the responsibility and cost for the design, creation, and installation of a cemetery memorial off grieving members of your family. Click here to see exclusive Rome Monument designs of Catholic monuments with exquisitely etched, engraved, and sculpted Catholic religious symbols, artwork and imagery. Learn more about ordering or purchasing your Catholic cemetery monument by requesting our Pre-Arranged Cemetery Monument Plan brochure, requesting a price estimate or list, scheduling a showroom visit, asking a question, or contacting a designer. With just a click you can share images from our Catholic Monument Design Gallery with family, or place an order online or by phone. We also offer many other cemetery monument services in Pittsburgh, Allegheny County, Western Pennsylvania, and the Tri-State area including Ohio and West Virginia. These include free delivery and installation, memorial maintenance and on-site engraving. So make the call now to 724-770-0100. The consultation is free and we will be happy to answer all your questions. If you have other inquiries, email us at info@romemonuments.com.